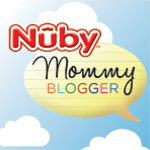 Welcome to my first review as a Nûby Mommy Blogger! As a member of their blogging program, I have the very great fortune to try out and review awesome Nûby products! 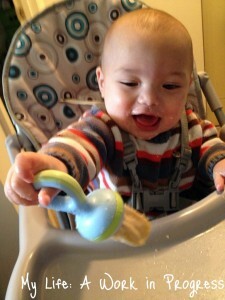 The Nûby brand has a slew of solid feeding items, but Baby J’s current favorite is definitely the Nibbler. He loves the freedom of being able to feed himself, and I love that he can do it safely. If your child is ready for solids, the Nûby Nibbler is a safe, BPA-free way to eat many of them. 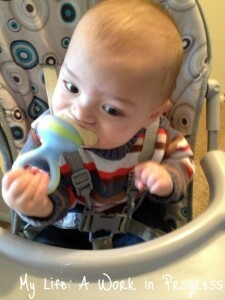 Babies can use the Nibbler to eat whole foods without choking. The Nibbler has a squeeze and twist locking system that’s adult-friendly but keeps kids from opening it inadvertently (or on purpose!). The included cap makes sure the Nibbler stays clean during travel and storage. Depending on the age of your child, suggested whole foods include: frozen fruits, fresh fruits, ice chips, veggies, and more. The first time my son used this, we put a frozen strawberry in it. He was not a fan, but my son’s never liked cold things, even when teething. I tried it again some days later with a big piece of banana- a food he loves. He immediately started biting the handle, not the mesh area with the banana. I actually took the Nibbler from him and started gnawing on the end myself, and he finally “got it.” From that point on, he went to town! The packaging says 10 months and up, but Baby J easily could have been using the Nibbler by seven months. Foods that we’ve discovered work well with our Nibbler: oranges, bananas, roasted (or boiled) carrots, and baked potato. Cleaning Tips- I’d recommend rinsing the Nibbler immediately after use before any food becomes crusted and washing as soon as possible. At the very least, drop the mesh into a cup of soapy water and let it soak. When it’s contained banana, I do both, because I’ve found that banana is more difficult to clean off than other veggies and fruit. I rinse the mesh inside out and use my finger to knock banana residue off the Nibbler. Then I soak it until it’s time to run the dishwasher. Right before I put it in, I rinse it again -both sides- and use my finger to knock any remaining banana bits off. I haven’t tried washing the Nibbler by hand, but when I use the dishwasher, I turn the mesh upside down over one of the prongs. If you’re worried about it flying off the prong during the wash, place a shallow dish (I use a baby bowl) over top to keep it on the prong. 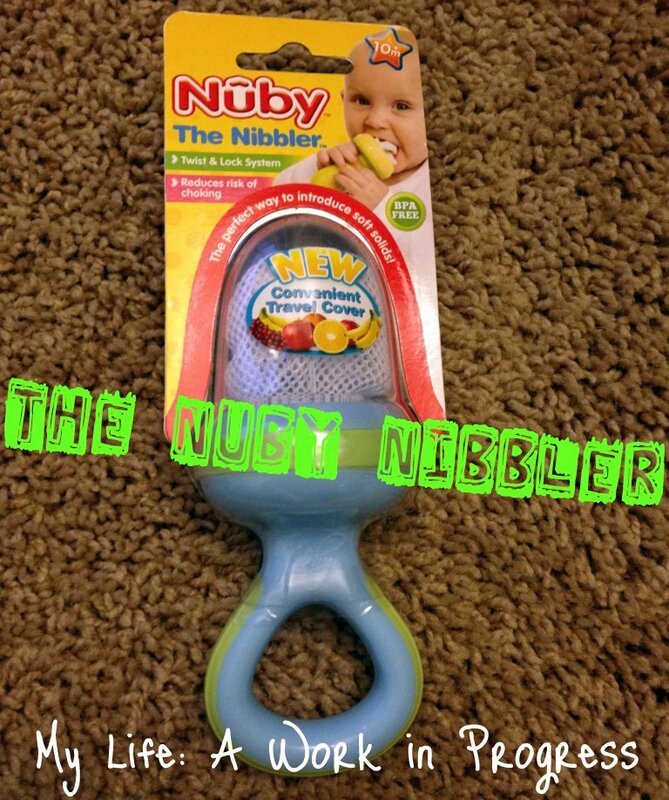 The Nûby Nibbler is sold as a single Nibbler or in packs of 2 or 3, depending on the retailer. Also, the one I reviewed has a ring handle, but there is a straight handle Nibbler available as well. Replacement mesh is also sold. For updates on new Nûby products, follow them on their social media accounts. They have giveaways all the time too, including right now! Click HERE for a list of open Nûby giveaways. Note: I received a complimentary product from Nûby but was not asked to write a positive review. I was not compensated for this post. The opinions expressed above are my own and may differ from the opinions of others. Post contains affiliate link. Oliver had one like this and hated it every time I tried it! I know a lot of kids like them, though. Your little guy is so cute eating his banana. Thank you! Baby J didn’t like his until he saw me eating from it- he wants ANYTHING I’m eating, so I think that did the trick for us! I’m going to have to try this when my daughter starts solids in a few months! My kids each had one of these. They were perfect for the summertime with fresh fruit in them or even frozen fruit! This looks great! I’m going to have to try one of these with our little guy! This is really cool. It would have been great for my daughter when she was a baby. I was skeptical about buying one our daughter actually! I appreciate the link and the post!!! I will hopefully be buying one for her soon! Thanks! Thanks for commenting, Krystal, just make sure to clean it or soak right after use, or it does get difficult to clean! I wish they had this cool gadget when my rugrats were babies. Great review ! We got one of these at the baby shower and I actually couldn’t quite figure out what foods to put in it….lol….so this was a helpful post. Itty Bitty has her top two incisors coming in and folks kept telling me to give her a raw carrot to chew on, but I was afraid it would be a choking hazard – so I put a baby carrot in one of these nibblers and she went to town without me having to worry about it becoming a choking hazard because of the mesh. I’ll have to try her regular foods in there too, but I’ll be keeping your advice to soak and clean in mind – as we had a bit of a rough experience trying it with mashed banana! Nice review i already order this product i ll get this tomarro!! I hope my lil gal lyk this!!! Pingback: Nuby giveaways- Win baby products!